Milwaukee Art Museum 20th-Century Design gallery. Before changes (above) and after (below). When you visit the Museum’s Frank Lloyd Wright: Organic Architecture for the 21st Century exhibition, you’ll notice that in addition to a trove of architectural drawings from the Frank Lloyd Wright Foundation, the installation includes drawings and furniture from the Museum’s permanent collection. In the “Commissioned Houses” section, alongside stunning drawings of Wright’s homes for specific clients, the Museum’s George Mann Niedecken Combination Daybed/Writing Desk/ Lamp sits grandly on a center pedestal. Designed for Wright’s Irving House in Illinois, the desk is reunited with an Irving House lamp on loan from a private collection. In the exhibition’s section on “Enlightened Workspaces” the Desk (on long term loan to the Museum) designed for the S. C. Johnson Company building in Racine is on view along side site plans, presentation renderings, and models. 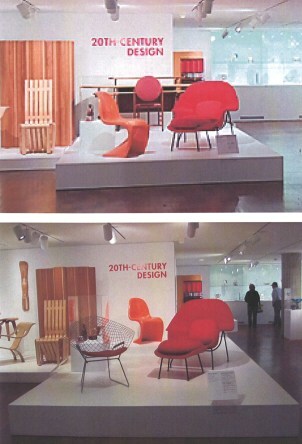 View of the Museum's 20th-century design gallery. 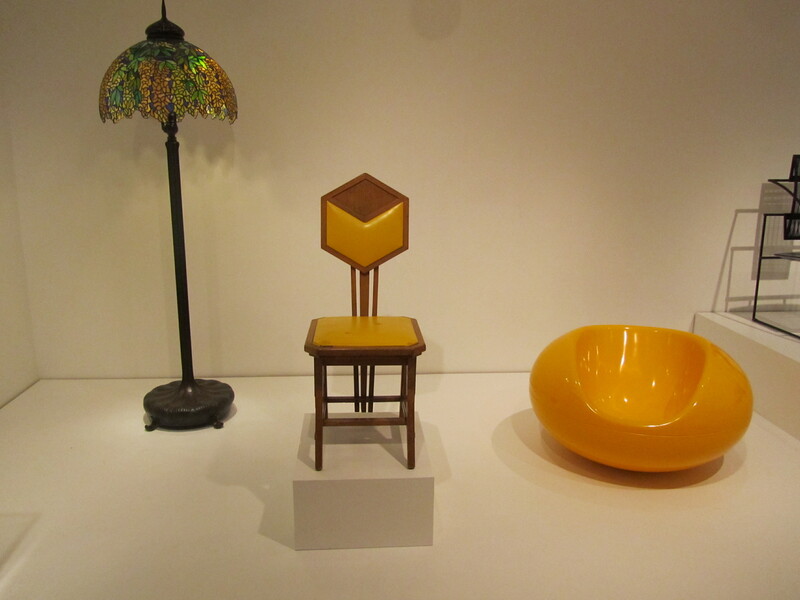 At center: Frank Lloyd Wright (American, 1867–1959), Peacock Chair for the Imperial Hotel (Japan), 1921-22. Oak, later synthetic leather upholstery. Milwaukee Art Museum, Gift of Frank Lloyd Wright Society of Japan, M1977.220. This exhibition is a rare opportunity to feature two treasures from our design collection within the context of Wright architectural drawings, models, and photos, and I think the desk and the daybed have never looked better. On the flip side, the movement of two large objects left gaping holes in the 20th-century Design gallery on the main level. Here’s how we rearranged that gallery, and what special addition you can now see. In place of the Niedecken’s Combination Daybed/Writing Desk/ Lamp, we used the extra space to give some “breathing room” and focus to Wright’s chair designed for the Imperial Hotel in Tokyo, Japan. Wright designed the Imperial Hotel, a hybrid of Eastern and Western architectural ideas, to symbolize Japan’s modern relationship to the West. The large project was constructed between 1915 and 1923, and required Wright to make six journeys to Japan. Interior view of the Imperial Hotel's Peacock Room, with Peacock chairs visible along right wall. Image public domain from Wikimedia Commons. The “Peacock” chair in the Museum’s collection was constructed by an unknown Japanese craftsman, but was specifically designed to be part of the Imperial Hotel’s Peacock room. In the image above left, you can see a view of the grand space used for dances, with a row of “Peacock” chairs and their distinctive diamond back along the right wall. View of the Museum's 20th-century design gallery. Frank Lloyd Wright, "Tree of Life" Window and "Barrel chair" for the Martin House, ca. 1904. Window: Milwaukee Art Museum, Gift of the Frederick Layton Art League in memory of Miss Charlotte Partridge and Miss Miriam Frink. Chair: On loan from a private collection. In another section of the Museum’s 20th-century Design gallery, you’ll find one of Wright’s most beloved designs: the “Tree of Life” stained glass window for the Darwin D. Martin House in Buffalo, NY. This spectacular window, or “light screen” to use Wright’s terminology, has been part of the Museum’s permanent collection since 1978. 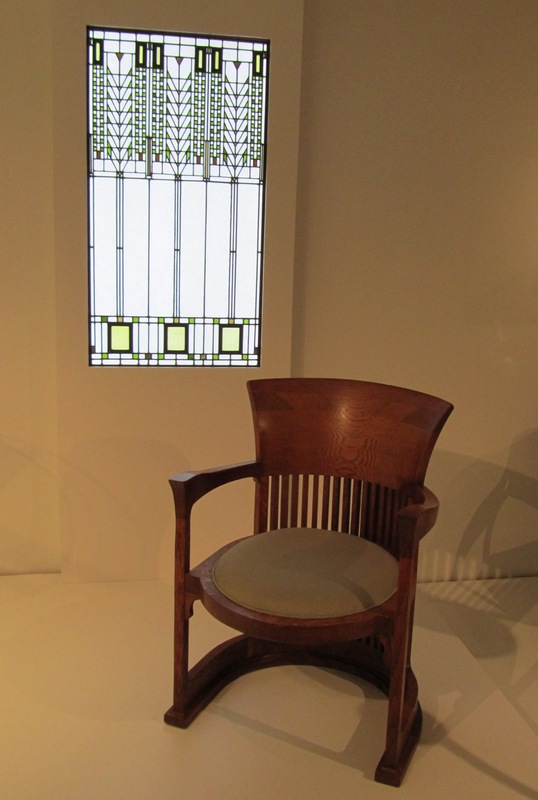 The window is united with a barrel armchair also designed for the Martin House, on loan to us for the run of the Frank Lloyd Wright exhibition. Wright built the Martin House between 1903 and 1905, and it is proclaimed by many to be one of the greatest examples of his “Prairie style” architecture. The Wikipedia article on the Martin House shows several historic images of the barrel form chair in situ with the home’s magnificent stained glass window program. In addition to the objects that are specifically designed by Frank Lloyd Wright, the 20th-century Design gallery has other objects by his Arts & Crafts Movement contemporaries. Look for a chair from the Craftsman Workshops of Gustav Stickley, a chair from George Washington Maher’s masterpiece “Rockledge” home in Minnesota, and a chest produced at the Byrdcliffe Colony of artists in New York. This entry was posted in Art, Behind the Scenes, Exhibitions and tagged 20th century art, American Art, Art Installation, Behind the Scenes, Decorative Arts, Design, Frank Lloyd Wright. Bookmark the permalink.